The recent Marcher Lord Press sale left one novel with an identity crisis. Courtesy Kerry Nietz FB author page. Ahem. Well, how has everyone been? Any excitement? Anything new? Anything worth talking about? Speculative Faith Hive Mind: Skip the chit-chat, Nietz. We want answers. News! What do you have to add to the discussion? 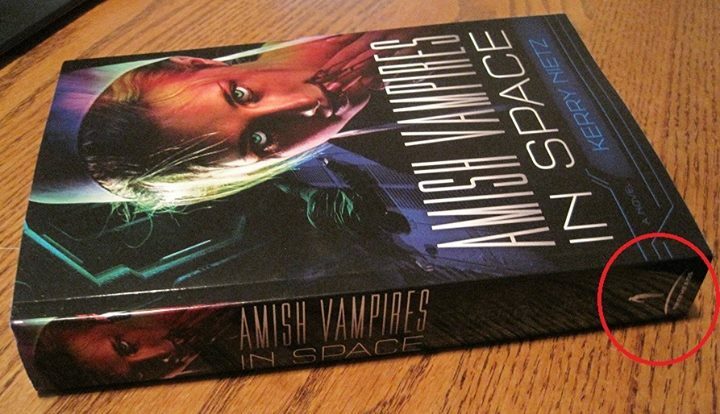 Amish Vampires in Space is out! Hinterlands is out! What happened, man? Me: Okay, I’ll start with the easy stuff. Marcher Lord Press has been sold, and the new owner, Steve Laube, has elected not to include Amish Vampires in Space as part of the new company’s catalog. HM: We know that already! How does that make you feel? That said, I certainly wouldn’t want one of my literary children in a place where it wasn’t wanted. Ten years ago, such a change would’ve resulted in a book being orphaned. Today, though, things are different. It is a straightforward process to create accounts with both POD and eBook providers. In fact, of any of the Marcher Lord Press authors, I was probably the best person for this sort of thing to happen to. (Aside from maybe Jill Williamson, because she’s sort of the queen of all media.) I already had a CreateSpace and eBook accounts set up from having republished my memoire FoxTales last summer. It was only a matter of revising the AViS eBooks and the print galley to replace references to the old publisher with that of my new imprint. As of now, and partially due to Steve’s and Jeff’s help and understanding, there will be no time where AViS is found unavailable to the general public. Both the print book and eBooks are already revised and out. They started showing up on Amazon a week ago. 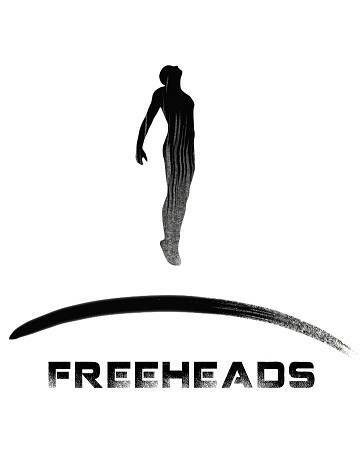 I’m also now the proud owner of a couple new domain names: Freeheads.Us and AmishVampiresInSpace.com. HM: So, no hard feelings? Me: Feelings are a matter of choice, aren’t they? Me: There were some things that probably could’ve been handled better. As Jeff mentioned in his video interview, this all happened pretty fast, and every time things are rushed, some things don’t get done as well as they might have been. No one knows that better than a writer. 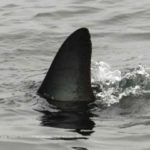 HM: Is it true that AViS was selling poorly? Or that it wasn’t mainstream enough? Me: I’m not sure any of my work is CBA mainstream. They’ve never gotten an award recognizing them as such anyway. All of the awards my books have received are from secular organizations. So take that as you will. Regardless, I never think about where my story fits. I just write what interests me. Thankfully, what interested me usually interested Jeff as well. As for sales, no, AViS was actually selling well by MLP standards. For instance in Amazon print sales alone, for the last eight weeks of 2013 I sold 60% of the print books I’ve sold there all year, and most of those were AViS. It wasn’t just a new release bubble either. 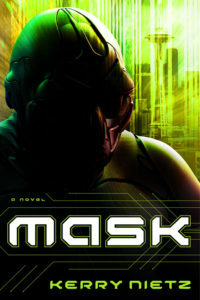 Mask came out in February and it didn’t have near the impact. Plus, there’s no denying AViS created buzz. In fact, I just had a pre-interview for a national radio show. HM: So, the book had good buzz and good sales. So what happened? Me: Steve hasn’t said much more to me than he has to you. <shrug> A man buys a business he can do with it as he sees fit, though. HM: Speculate then. Why do you think he made the decision not to carry AViS? Me: LOL. There it is, isn’t it? That’s when I realized that this might be a God thing. That I should just back off and buckle down for self-publishing the book and let the blessings fall where they may. Plus, beyond my own feelings and self-interest, I thought this sale could be in the best interest of everyone else involved—especially my friends the other MLP authors. Unlike many of the rest, I’ve been traditionally published before and seen my book in a bookstore. There’s a special feeling to that. I wouldn’t want to deny the rest of them that thrill over my little book. HM: It was the Amish factor, wasn’t it? Me: Again, I can’t know for sure. I did have one author friend share how he/she was verbally assaulted because of AViS. Like, this other person was mad at my friend for the existence of my book. Crazy. Frankly, I think the whole backlash against AViS illustrates how superficial even Christian readers are. That book is no more or less a straight sci-fi tale than anything else I’ve ever written. I’m quite proud of it, and my conscience is clear on what I’ve written. Yet, it has been summarily judged by a vocal group of Amish defenders based, not on its content, but on perception. Based on its cover and title. That’s my one regret. That AViS has been attacked for all the wrong reasons, by people who have no idea what’s in it. Apparently there are some sacred cows that you just can’t challenge—and they have nothing to do with the gospel. Just perception. At some point I may write another article that touches on all I’ve learned about the status quo as part of my research for this book. I have some fascinating stories. HM: Yes, we bet you do. So, what’s next for Kerry Nietz? Any more stories? Is Marcher Lord Press a possibility? Me: Good question. In some ways, I’m just like you: willing to wait and see. Steve and I have discussed future publication at Marcher Lord. He said my ideas are always welcome, and that he has no intent to turn MLP into a “friendly unicorns only” publishing house. That said, I would hate to spend another year of my life on something only to find I’ve crossed another imaginary line. Milked another sacred cow. 🙂 So I’m going to have to think hard about what comes next. 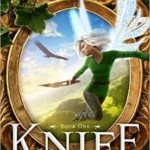 There were a few unanswered subtexts at the end of AViS, though, and from a reader’s perspective, I really want to know how those resolve. Obviously, I’d have to go completely on my own on that one. That isn’t a bad thing to do while you’re waiting, though, is it? I am the Hive Mind! Of the Hive Mind, you’re the Borg Queen. Because you can’t do a good enough facepalm to be Captain Picard. Woohoo, your own imprint! Looks great. So glad you have a workable solution to this. I love your logo! I really appreciate this interview! I’ve been lurking around following the MLP changeover, and I really appreciate how transparent people have been. Granted, there are plenty of things that are kept private, but I’m not one to believe the Information Age entitles the public to all the gory details. Also, I’m blessed by the great attitude you display, Kerry Nietz. It’s inspiring because it is so easy grouse on about the whole writing and publishing process, but things do happen. The awesome thing about being a Christian is that we have the comfort of knowing that somehow, God has a plan in all this. Glad to hear you’re all set and ready to go, Kerry. Ha, “Disgruntled Unicorns” sounds like an awesome band name. I’m glad that AViS will live on with Freeheads and look forward to what you do next! 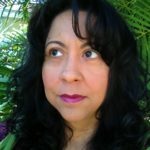 BTW, if anyone is interested in ordering the book through CreateSpace, (https://www.createspace.com/4584197) I have a discount coupon available: VFFSZGQE, which will get you 3 bucks off. Pretty much takes care of shipping. Thanks for sharing about this, Kerry. It’s been really interesting seeing all the different sides of this buy-out. I haven’t read AViS yet, but I’ve read all the other books you’ve written and I am looking forward to reading it soon. I really should look into the author’s other work–I won a free copy of AViS, but the others aren’t showing up on interlibrary loan lists. It doesn’t matter to me who publishes your books, I’ll still read them. Do I dare quote Oscar Wilde? Oh, yeah, I think so: “It is only shallow people who don’t judge by appearances…” People who judge(d) your book by its cover are either the “status quo” as you claim, or they aren’t shallow. Keep holding on–this ride may have just begun! Thanks, Frank. Tis good to hear from you again. all. The movie also won an award for Best Adapted Screenplay.